By and large, by the time mid-September has rolled around the night fishing train has seen its caboose fade into the distance. Some folks are off chasing migratory fish, or maybe muskies. Others are shifting focus to the fall hunting season. These are all good things for the September mouser. If part of the rationale behind night fishing is escaping the crowds, it’s harder to escape them more thoroughly than going out into a late summer night (that’s right; it’s still summer, for a few days more, at least). It just might be the most predictable riparian solitude of the year, no matter where you fish. What makes fall great for streamer fishing is also what makes it good for mousing. Large fish move upstream out of the hardest water to target them in—large, wide, slow beats of river and reservoirs—into shallower water as they get ready to spawn. Fish density increases tremendously as large numbers of large fish move into these pre-spawn staging areas. What this means, mathematically, is that your favorite beat of smaller water, that one you know oh-so-well because you’ve waded it a thousand times, is going to be hosting more and larger fish than at any other time of the year. This is the time to metabolize your knowledge of the systems you fish. You know where they live. You know where they go. Go get them. Not only are trout packing closer into tighter spaces–they are also feeding with an increased sense of purpose and urgency. As the season has worn on, the bugs have gotten smaller and smaller, meaning fish have a serious need for calories as the spawn approaches. This holds for brook trout as well as browns. 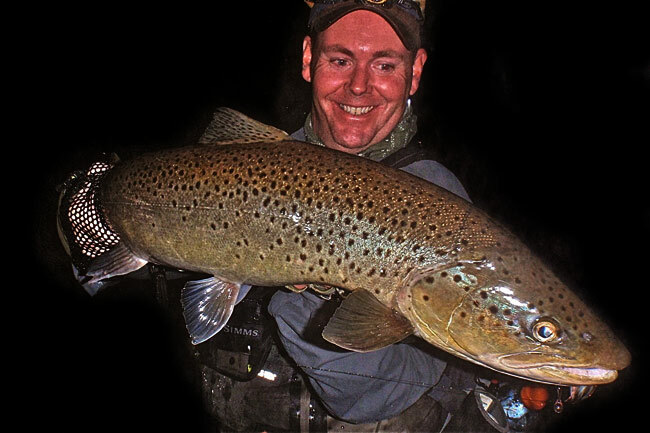 Yes, it is possible to catch brook trout at night. All of my three largest brook trout were caught after hours on large, articulated flies I didn’t think could fit into their maw. They did. And then some. 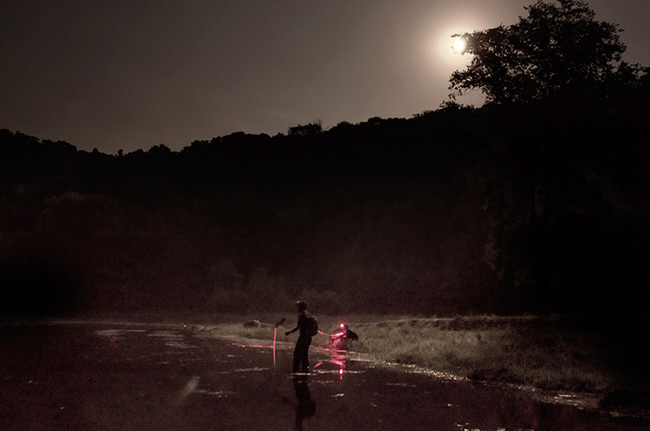 Anyone who makes the effort to fish at night does so for reasons beyond merely catching fish. They are infatuated by the dark in some way. So if you’re a night-time aficionado, it’s worth noting that the darkness of September is different kind of dark. The sounds are different, the smells are different, the behavior of the nocturnal animals you share the space with (whether you know it or not) is different. Whereas a mid-summer’s night feels like a thing without end, a late September night is full of winter omens and biting change. While both mid- and late-summer nights can be eerie, they get their eeriness from a different place. To make a long story short, if you just plain like being outside in the woods at night, give a September evening a whack. On a midsummer’s night in Michigan, you usually have to wait until 11 PM for full-on darkness. Not so at the end of September. Depending on your time zone, you’ll be looking at a 7 or 8 PM sunset, which means mouse-able light by 7.30 or 8.30. That means a solid few hours of lights-out fishing without having to mainline 5 Hour Energy or snort instant coffee. This picture is worth a thousand words and at least a couple hundred smiles. Here, Michigan’s original Midnight Rider Tom Lynch reaps the reward a well-swung rodent. Could this be you?